Project WET is Water Education for K-12 Teachers! (Also see our newest guide for early childhood below). Our goal is to promote awareness, appreciation, knowledge, and stewardship of water resources through classroom-ready teaching materials and educator workshops. Our Mission is to bring WATER EDUCATION to the world! designed for formal and non-formal educators of K-12 students grounded in defined beliefs reflected in the curriculum and training techniques. of interdisciplinary activities developed, field-tested, and reviewed by educators and professionals and correlated to the current Georgia Education Standards. offering Educator Workshops and Facilitator Workshops. Water is for all water users. We must manage water sustainably. We need to take personal responsibility for water resources. What else can I do with Project WET? Connect to the PORTAL: access additional activity resources and information using the special code inside your GUIDE. Connect to DISCOVER WATER: use this free site with students to give them a fun and exciting way to better understand our water resources. Connect to NATIONAL PROJECT WET: visit the store, sign up for an online workshop, see what is happening with our global initiatives. See the 2018 GA River of Words Contest WINNERS! We proudly present our 2018 State and National ROW winners... Don't forget -- Enter the 2019 ROW Contest by February 1! See all of the rules, forms and suggestions here. Our newest publication is here-- Getting Little Feet Wet for ages 3-6! Here is your guide to water education activities for our youngest learners. This guide is standards-based and rigorously field tested throughout the U.S.
Who doesn't love MAGIC?! Bring the Magic of Water to your classroom. Each lesson is intended to introduce a Project WET activity and to get your students engaged in water resources! Don't miss this opportunity to receive certification for WET, WILD and PLT all in one workshop! Join us in south Georgia! 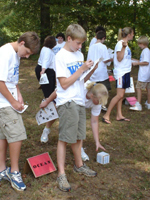 Enjoy our Georgia Project WET e-newsletters which feature articles of interest to WET teachers and facilitators, including state-specific water topics and ways to incorporate Project WET activities. To subscribe free of charge, email us with your request.